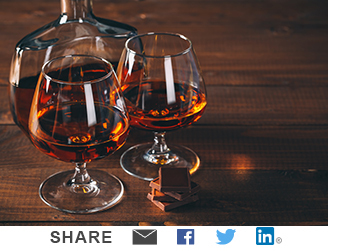 For a beverage marketer, there's something truly terrific about cognac. Wine and champagne have the romance of grape variety, age and origin and Scotch whisky has an undeniably strong history and perception of quality. But when done right, cognac combines all of these positive attributes with a luxury halo in a way no other drink can approach. Believe it or not, you can probably thank corruption in China for cognac's current U.S. renaissance. Cognac is certainly not new in the U.S., but recent trends have been spectacular as the cognac houses have substantially increased their efforts in the market in recent years. We saw extraordinary growth in all the major brand labels last year and we think there's plenty of runway ahead. From our proprietary DrinkTell numbers, cognac and brandy combined in the U.S. is still a minnow in relative terms at about 13 million cases sold in 2017. Cognac is also an entrenched oligopoly with four players (known as 'houses') dominating the global market with more than 80% share: Hennessy (LVMH), Martell (Pernod-Ricard), Rémy-Martin (Rémy Cointreau) and Courvoisier (Suntory). Hennessy is by far the U.S. leader with 30% share of brandy/cognac, also per DrinkTell. In the early 2000s, cognac enjoyed a big leap forward as hip-hop artists publicly embraced the drink, most notably in the classic jam Pass the Courvoisier by Busta Rhymes and P. Diddy. The early 2000s cognac craze driven by Busta and Diddy ultimately died down, but the category clicked along at respectable low-single-digit growth rates until 2014, when it peaked up to mid-single-digit rates, driven by renewed focus on the category. 2016 was a great year, with growth up more than 7% on our estimates. Looking ahead, we see the category growing mid-single-digits for 2018 with conservative estimates going forward, but still plenty of upside to our numbers. So why this recent renaissance? It isn't the overall brown spirits boom or accelerated consumption in urban markets which has driven the recent success of the category. It has been surprisingly the ripple effect of Chinese efforts to stem corruption and the cognac industry's decision to refocus on the U.S. market as a result. But we live in a globalized world and events abroad can ripple here in the strangest of ways. In 2012, a new Chinese government lead by President Xi Jinping passed sweeping anti-corruption and anti-extravagance regulations felt far and wide across the country. Hundreds of government officials and businesspeople were caught up in the changes and were punished, often harshly. This was an extraordinary turn of events in a country where personal relationships play a pivotal role in the interactions between government and business officials. Traditionally, there was a bit of grease expected between parties to move the wheels along and, in many cases, that grease was in the form of an expensive bottle of cognac, baijiu or whisky. That came to an abrupt ending in 2012. China's anti-corruption practices turned into a disaster for the international liquor companies, which until that time were having an extraordinary run of success in the country. In the years leading up to the regulatory changes, international spirits were booming in China and two major forces were driving that growth. The first was simply the growing love of cognac by the Chinese, especially the expensive XO and XO+ varieties, which became the beverage for conspicuous consumption at high-end banquets. Gifting was a major driver and expensive cognac was often used as currency between business and government officials. The second factor driving international spirits was the sudden trendiness of Scotch whisky mixed with green tea. That somewhat odd sounding mix became a trendy cocktail, especially in the karaoke bars and high-end restaurants of China's new burgeoning big cities. In the early part of this decade, before anti-corruption took hold, the major spirits companies were confronted with the high-class challenge of how to slow volume demand for products with limited supply such as Scotch whisky and cognac. To stem demand, prices were raised aggressively, often multiple times a year. That worked. Until it didn't. After the anti-corruption regulations passed, for the next three years, the Chinese divisions of the major international spirits companies eroded badly. Pernod Ricard, the China cognac market leader with 40% share through Martell, saw its China business slump, leading to a drag on its stock price. Rémy Cointreau, the company who had made the biggest bet on expensive cognac in China, saw its stock price halve. LVMH suffered as well. Diageo, who had taken a major stake in a local baijiu business, saw its Chinese profits plummet. Additionally, the popularity of scotch whisky collapsed, leading to declines in Pernod's Chivas Regal and Diageo's Johnnie Walker, which are still felt today. Presented with the reality of a Chinese market which might never fully recover, the cognac players suddenly rediscovered the U.S. market. In doing so, there was the realization that the industry in its long efforts to sell to the urban community had indeed forgotten to sell to the broader population. With an unclear outlook in China, it became time to capitalize on a long-sleeping opportunity. Now we're seeing that focus in sales and marketing to the broad market with brands like Remy's 1738 Accord Royal. Growth numbers have followed as a result. Looking ahead, we see plenty of pent up demand for cognac and we expect the category to keep rolling as China recovers slowly and the cognac houses keep benefitting from a booming U.S. So pass the Courvoisier. Or the Remy. Or the Martell. Or the Hennessey. Or another brand yet to be discovered.